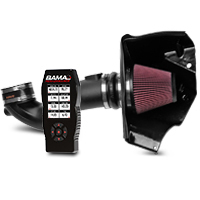 Please select options for Airaid Race Cold Air Intake & BAMA X4 Tuner (05-09 GT) at the top of this page. More Power. Now you can add even more power to your 2005-2009 4.6L GT Mustang with an Airaid Race Cold Air Intake and SCT SF4/X4 Combo pack from AmericanMuscle that includes Free Custom Bama Tunes for Life! Improved Airflow. Enjoy the legendary performance advantage of Airaid's cold air intakes. 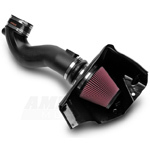 Their industry leading design replaces your 2005-2009 4.6L V8 Mustang's restrictive stock air box and paper filter element with a high flow intake tube and rechargeable filter for a noticeable increase in horsepower, torque and acceleration. Installed Airaid Race cold air intake can really feel difference in performance. Highly recommended for your Stang!